For the set that appears in Duel Monsters 5 Expert 1, see Vol.1 (DM5-BP). For the set that appears in Duel Monsters 6 Expert 2, see Vol.1 (DM6-BP). Vol.1, short for Volume 1, is a Booster Pack that was released on February 4, 1999 as the first set in the Yu-Gi-Oh! Official Card Game. Like all Series 1 sets, Vol.1 cards used the Series 1 card layout, distinguished from later layouts by the lack of a Card Number beneath the card's artwork and the Eye of Anubis Hologram in its lower-right corner. In addition to being the first set in the OCG, Vol.1 introduced two cards to the entire franchise. All but 15 cards have been reprinted in Japanese, and all but ten of them have been printed in the Yu-Gi-Oh! Trading Card Game. Vol.1 was reprinted as part of the 20th Anniversary Set. "Dark Magician" was introduced in Yu-Gi-Oh! Duel 038: "The Terror of Blue-Eyes!! ", published in the 1997 issue 30 of Weekly Shōnen Jump, with a cover date of July 7. It was also printed as card #14 in the Bandai set 1st Generation, released on April 4, 1998; featured in Yu-Gi-Oh! (Toei) episode 003: "Clash! The Strongest Monster", originally aired on April 18, 1998; and printed as cards #02 and #03 and part of card #00 in the Bandai Sealdass sticker set, released on January 20, 1999. "Gaia The Fierce Knight" was introduced in Yu-Gi-Oh! Duel 037: "To the Death!! ", published in the 1997 issue 29 of Weekly Shōnen Jump, with a cover date of June 29. It was also printed as card #11 in the Bandai set 1st Generation; featured in Yu-Gi-Oh! (Toei) episode 024: "Now! The Time of Decision - The Miracle of Friendship", originally aired on September 12, 1998; and printed as cards #16 and #17 and part of card #00 in the Bandai Sealdass sticker set. "Hitotsu-Me Giant" was introduced in Yu-Gi-Oh! Duel 027: "Project Start! ", published in the 1997 issue 18 of Weekly Shōnen Jump, with a cover date of April 14. It was also featured in Yu-Gi-Oh! (Toei) episode 015: "Eerie Woman!! Unable to Transform", originally aired on July 11, 1998; featured in the video game Yu-Gi-Oh! Monster Capsule: Breed and Battle, released on July 23, 1998; printed as card #93 in the Bandai set 3rd Generation, released on October 10, 1998; and printed as card #11 in the Bandai Sealdass sticker set. "Mammoth Graveyard" was introduced as card #75 in the Bandai set 2nd Generation, released on April 7, 1998. All of the cards in Vol.1, except for "Fissure" and "Trap Hole", were previously featured in the video game Yu-Gi-Oh! Duel Monsters, released on December 16, 1998. 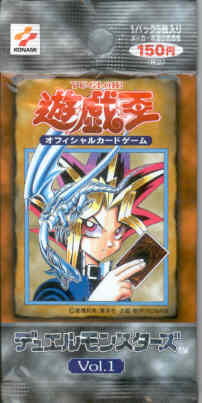 Two cards, "Dark Magician" and "Hitotsu-Me Giant", were also printed as Konami's Duel Monsters promotional cards bundled with the game. 25 Vol.1 cards have since been reprinted in Japanese: five cards in Booster 1, nine cards in EX Starter Box and EX-R Starter Box, and 23 cards in Legend of Blue Eyes White Dragon. All but ten cards have since been printed in the TCG. "Book of Secret Arts", "Dark Hole", "Dark Magician", "Fissure", "Gaia The Fierce Knight", "Hitotsu-Me Giant", "Mammoth Graveyard", "Silver Fang", "Trap Hole"
"Beast Fangs", "Book of Secret Arts", "Dark Gray", "Dark Hole", "Dark Magician", "Firegrass", "Fissure", "Gaia The Fierce Knight", "Hitotsu-Me Giant", "Kagemusha of the Blue Flame", "Kurama", "Legendary Sword", "Mammoth Graveyard", "Nemuriko", "Petit Angel", "Petit Dragon", "Power of Kaishin", "Red Medicine", "Silver Fang", "Sparks", "The Furious Sea King", "Trap Hole", "Violet Crystal"
"Archfiend Mirror", "Candle of Fate", "Curtain of the Dark Ones", "Eyearmor", "Fiend's Hand", "Fire Reaper", "Haniwa", "Hitodenchak", "LaLa Li-oon", "Meotoko", "Sectarian of Secrets", "Tomozaurus", "The Drdek", "Thunder Kid", "Winged Cleaver"
"Archfiend Mirror", "Candle of Fate", "Eyearmor", "Fiend's Hand", "Fire Reaper", "Hitodenchak", "Hourglass of Life", "LaLa Li-oon", "The Drdek", "Winged Cleaver"
Despite "Blue-Eyes White Dragon" being featured as this pack's cover card, it was not released until a month later, in Starter Box: Theatrical Release.